Germany’s Chancellor Angela Merkel stressed the importance of multilateralism and warned that we haven’t learned from the darkest days of history. One hundred years on from the end of the First World War, Merkel said that leaders had “sleep-walked” into that catastrophe. “Have we actually learned the lessons of history? We haven’t really,” she said in a plenary session at Davos. The spirit of multilateralism that rebuilt Europe and formed our international institutions in the aftermath of the Second World War was now under threat, she said. “We see populism on the rise, we see a polarising atmosphere and a polarising state of affairs,” she said. 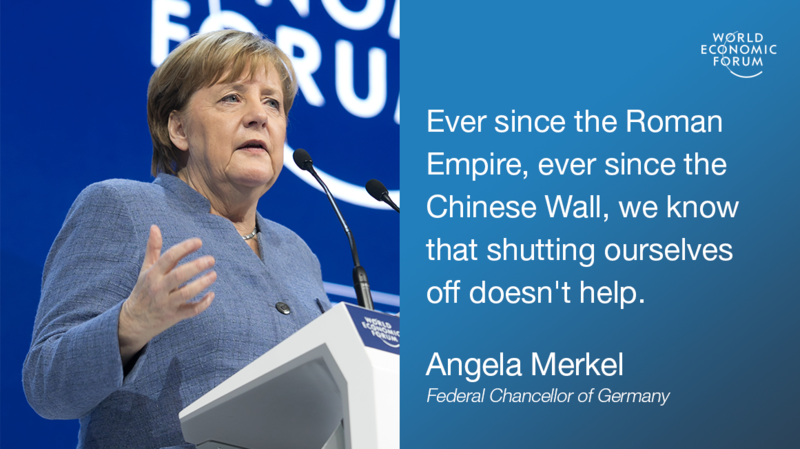 While tackling challenges like migration, Chancellor Merkel called for cooperation, not isolation. The Chancellor also said that Europe had a responsibility to address the migrant crisis at its source and to “partner” with countries on the path to development. The Chancellor also signalled a more assertive foreign and defence policy for the European Union. “We need to take more responsibility; we need to take our destiny into our own hands,” she said, adding that there had been significant “convergence” in the EU on this issue. The digital economy was another major theme in her speech. The Chancellor of Europe’s largest economy, currently enjoying strong growth and record low unemployment, said there were long term challenges amid a huge digital shift. “If we don’t manage it we will have Luddites as we did in the past,” she said. “Data will be the raw material of the twenty first century” – which brings with it complex challenges, from economic inclusion to privacy. The EU would shift towards a "common digital market," she said.